The Lexicon PCM 80 brings you exciting new effects with extensive processing and control capabilities, and uncompromising sonic clarity. The Lexicon PCM 80 contains a built-in library of 200 preset programs that provide a comprehensive array of effects ranging from beautiful and lush to completely wild. The presets are organized into 4 Banks of 50, and functionally grouped for a wide range of applications. Be sure to experiment with all 200 presets to get a feel for the full range of Lexicon PCM 80 capabilities. Every preset has one or more of its parameters patched to the front panel ADJUST knob, giving you instant control over the primary aspect of the effect – without going into Edit mode. In the preset, Concert Hall, for example, Mid Reverb Time is patched to ADJUST. When you turn the knob, you will adjust the reverb decay. In Prime Blue, ADJUST is patched to several parameters, so that turning the knob changes the effect from a tight chorus, to a chorus with recirculating echoes and, finally, into a reverb. 4-Voice and 6-Voice. 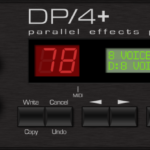 The 4-Voice algorithms: Concert Hall, Plate, Chamber, Inverse and Infinite each combine a specific type of reverberation with a 4-voice, general purpose, stereo effect “toolbox”, as well as additional post-processing for the reverb. The 6-Voice algorithms: Glide>Hall, Chorus+Rvb, M-Band+Rvb, Res1>Plate and Res2>Plate each combine a specific type of reverberation with a specialized 6-voice stereo effect. All Lexicon PCM 80 algorithms include several parameters that make it possible to create dynamic spatialization effects for 2-channel or surround applications. Check out the Ambience Effects in Bank P1 and the Spatial Effects in Bank P2 for examples. The Lexicon PCM 80 gives you a unique set of tempo controls.Tempos can be tapped in with the front panel Tap button (or an assigned controller) or “dialed-in”, in BPM (beats per minute) on the display. The Lexicon PCM 80 also lets you generate MIDI clock from your tempo, as well as receive MIDI tempo from an external sequencer or drum machine. In the Lexicon PCM 80, tempo can control LFO speeds and Time Switch controls, as well as all delay parameters, ensuring that all of your modulations are in tempo with your music. You can even set independent rhythmic values for different parameters within a single program on the Lexicon PCM 80. Tempo can be set and displayed in either rhythmic value or time values. Many presets, particularly the Rhythmic Echo & Delay Effects in Program Bank P1, have delay times assigned to Tap tempo. Try loading some of these and pressing Tap twice in rhythm to change tempo. An enormous range of editing control is provided for each algorithm, with parameters organized in an edit matrix of as many as 100 main controls. In addition to providing this powerful sound design capability, the Lexicon PCM 80 also allows you to customize these controls for your day-to-day editing needs, or to use a subset of controls specially designed for each preset. The Lexicon PCM 80 has two levels of Edit Mode control called Go mode and Pro mode. In Go mode, the most useful parameters within an effect are grouped for instant access via the front panel Edit button. Each preset has a specially selected set of Go mode parameters which let you make value changes to the effect without losing the character of the sound. Pro mode gives you access to the full parameter editing matrix for the algorithm of any loaded effect when you press Edit. 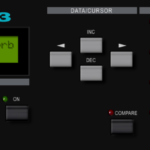 In this mode, you can access a complete set of Modulation and Patching parameters, create your own ADJUST knob patch and assign your own Go mode parameters. A unique Patching and Modulation system provides unprecedented control over your effects, with a versatile set of internal modulators: LFO, AR Envelope, Envelope Follower, Latch and Time Switches. These allow you to create modulation sweeps which move in time with music, or wildly animated effects. You can create as many as 10 patches per effect, each with as many as 8 pivot points. You can patch multiple parameters to a single controller, or patch multiple sources to a single destination. The front panel memory slot will accept industry standard PCMCIA SRAM cards (up to 1Meg). Use these cards to store effects (as many as 2350 on a 1 Meg card), system setups, MIDI program maps, and more. Lexicon PCM 80 internal audio memory can be expanded from a maximum stereo delay time of 2.6 seconds to more than 42 seconds by installing 4Meg memory modules (SIMMs). For all of its programming power and flexibility, you’ll find the Lexicon PCM 80 simple to use. The large, 2-line fluorescent display is easy to see from any angle whether the surroundings are bright or dark. Separate SELECT and ADJUST knobs make program loading and editing quick and easy. We’ve even designed in a special Info mode — press and hold any button to find out what its function is, or to get status information such as the name of the running effect, current tempo rate, etc.